In the Fed’s March policy statement this week, a funny thing happened on the way towards acknowledging the stronger US economic data of late – they largely ignored it and buried notice beneath a blanket concern for the ailing health of the global economy. 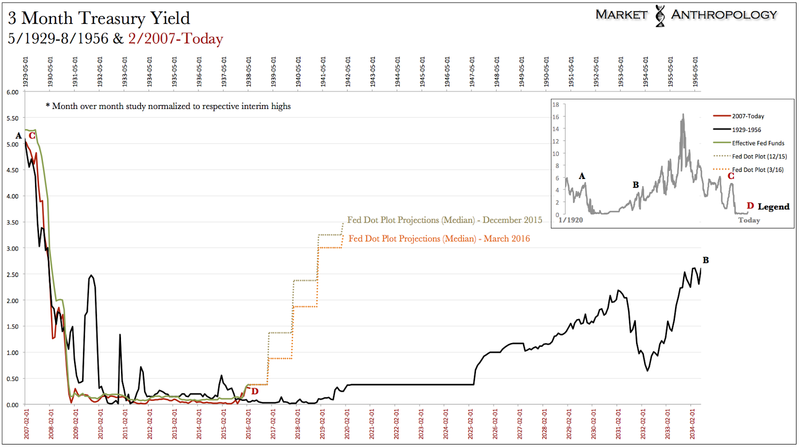 By doing so, they broke the back of the US dollar, which had already begun unwinding the overshoot – that to a great degree had been motivated by the Fed’s own projections over the past two years of a tightening cycle more comparable to previous contemporary rate hike regimes, than the realities of normalizing policy from ZIRP. When the dust settled on the statement, the Fed had walked back their scope for raising interest rates through the end of this year from one percentage point to only half a percentage point and lessened the trajectory of prospective future rate hikes through 2019 to 3.25 percent from 3.50 percent. Why they chose the March meeting to shift expectations is an open question – as well as the follow-up of whether the Fed’s “hike-hype” was always a strategy to begin with. As we’ve noted over the years, in the trough of the long-term yield cycle where a fraction of a percentage point is likely the best the Fed can reach for, policy is administered through posture as much as action. While it was more discrete than conventional policy expectations, a strong dollar – disinflation and rising real yields largely accomplished the heavy lifting of tightening for the Fed this time around. 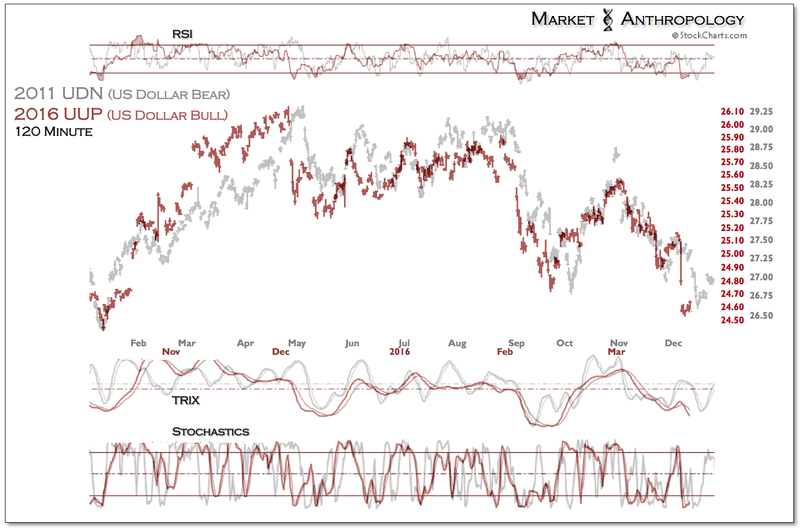 As mentioned in previous notes (most recently, Here), we know in past cycles –and characteristic of markets forward discounting dynamics, the dollar strengthens during the expectation phase of tightening (buy the rumor) and typically begins to weaken as markets become confident that the Fed will move (sell the news). 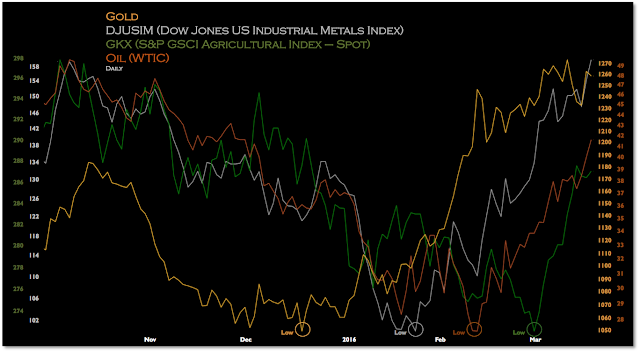 For the dollar in this cycle, we’ve referred to it as - buy the hype/sell the bluff. 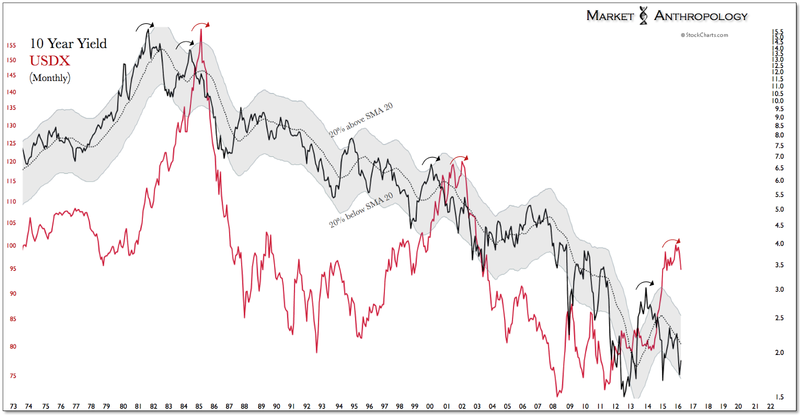 The bluff being: the posture and expectations shaped from comparisons to more conventional tightening cycles would ultimately have stronger influence within the markets, than the actual structural significance of a fractional hike. Moreover, the ambiguous and prolonged nature of this cycle’s expectation phase - in the face of multiple large easing initiatives around the world, allowed participants an abnormally large and fertile window to build assumptions and positions in the US dollar; regardless, that the Fed would likely never achieve the same reach as they have in more recent tightenings. This is one of the main reasons we’ve carried a bearish long-term outlook towards the dollar, as we’ve viewed the rally as predominantly built around misplaced expectations from Fed posturing, rather than more underlying structural support - such as a secular move higher in yields or growth that would also likely sustain a more lasting move in the dollar as well. It is also why we have viewed the large reflex and retracement in yields in response to the taper in 2013 as the leading move for the dollar, as the Fed advanced into the next phase of normalizing policy from an extraordinary position. The fact remains that despite hiking the fed funds rate a quarter percentage point in December, financial conditions have actually loosened as nominal yields have fallen but inflation expectations have firmed. 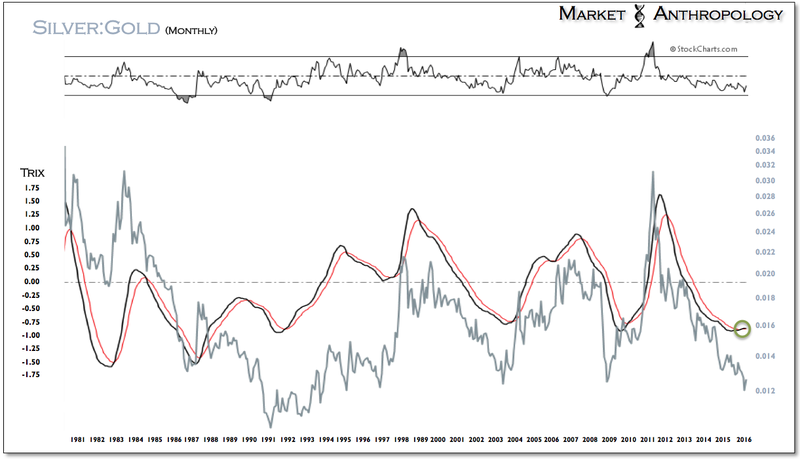 This is the opposite dynamic of the taper tantrum in 2013 where real yields spiked as inflation softened and nominal yields rose sharply. Over the past several months we’ve speculated that just as the Fed’s tightening regime was as discrete and unorthodox with conventional wisdom, the dynamics in which easing might be accomplished today could be just as atypical. 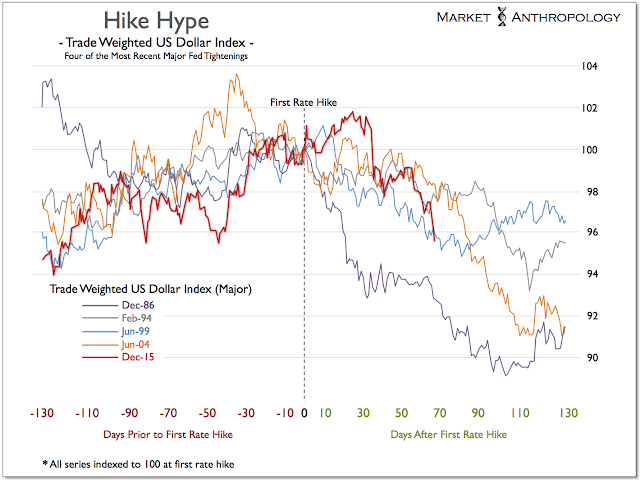 As noted above, a strong dollar – disinflation and rising real yields largely accomplished the heavy lifting of tightening for the Fed and a weaker US dollar could broadly reverse those same effects both domestically and abroad. It remains our opinion that should the dollar continue to weaken it would create the smoothest transition during another esoteric period of policy normalization, as the Fed would certainly hold serious reluctance to quickly unwinding its move off ZIRP or entertain a far more uncertain and hence less effective approach such as negative rates. As we mentioned in a note last month (see Here), the Federal Reserve Bank of San Francisco recently published an Economic Letter that argued by allowing inflation to overshoot the Fed’s 2 percent target, it would achieve the greatest decline in real yields and hence stabilize economic activity fastest (see Here). We would argue that what the Fed effectively did this week by discounting the firming US economic data and deferring to a general concern for the health of the global economy is shift their reaction function to a willingness to remain behind the curve on inflation. Hyperbole aside – it's a rather big deal. And while markets have already been reflecting this shift in inflation expectations for several months as gold has predictably led the broader reflationary trend – to see the Fed bless this perspective should reinforce investors convictions that market conditions are shifting favorably towards supporting assets like precious metals, commodities and emerging markets that were left for dead as financial conditions tightened and real rates rose over the past several years. As shown below, although the Fed pulled back their rate hike projections this week – from a historical perspective of the long-term yield cycle, they likely still have a ways to go towards aligning expectations with reality. Moreover, while nominal yields may firm over the coming months, the prospects for the dollar from a policy or intermarket point-of-view look quite clear: lower for longer as well. The inverse cycle comparative that we've followed for the dollar took the next pivot lower as the Fed shifted posture this week. As we highlighted a few weeks back, gold had led the broader commodity complex higher – with industrial metals, oil and agricultural prices now catching up with gold's leading breakout move. All things considered, the near-term prospects for gold remains less compelling here, as we suspect the retracement move lower will continue. 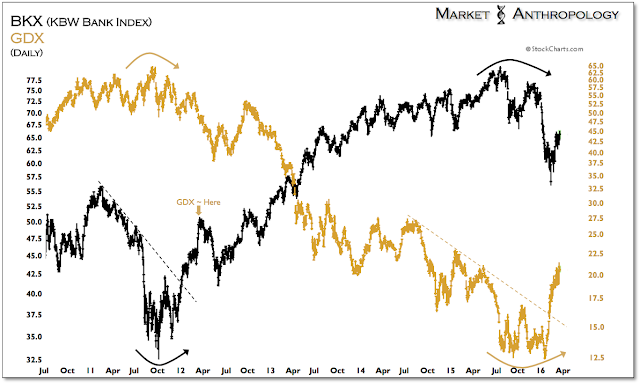 Our GDX comparative with the banks in 2011 is also now aligning with a retracement move lower over the coming weeks. 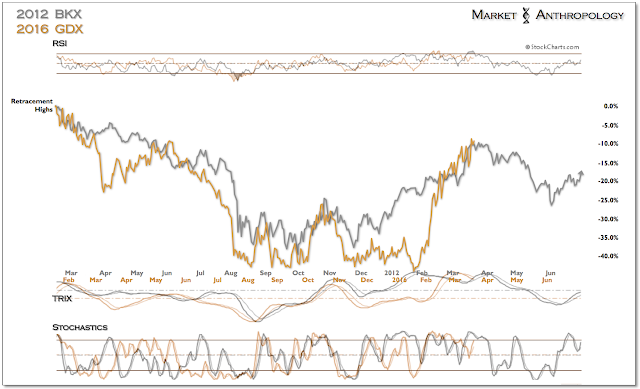 Coming out of this prospective retracement, we will be looking for silver to begin outperforming gold – if the reflationary trend is more than just an ephemeral condition. Regardless of the Fed's apparent shift, this perspective continues to look compelling considering the bullish long-term set-up in the silver:gold ratio.